Retirement is something which every one ought to plan right from an early stage. Often people make the mistake of not having a futuristic outlook especially in the prime of their life when they are earning steadily. They underestimate the importance of retirement planning and realize their mistake only when it is too late and by then, they are forced to curb their lifestyles drastically. It is very important that you start planning your retired life meticulously right from the start of your career so that by the time you bid adieu to your employment days, you can be assured of a neat sum of money that will be a source of comfort to you in old age. Financial security during your retired life is very important to lead a stress free and comfortable life. This can be achieved by planning and channelizing your income in the best possible manner. Basically, you can count on four different types of income during your retired days. These are social security benefits, personal savings and investments, retirement plans sponsored by employer, and post retirement employment income. 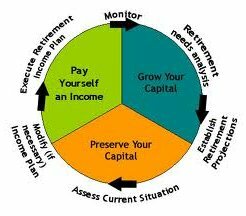 You need to be aware of the advantages and demerits of each one and also need to have a rough idea of the needs that have to be met in your retired life so as to plan your investments effectively. These days one comes across a variety of online retirement income calculators that can help you plan out your forthcoming days. A financial consultant or an expert in the related field would also be able to help you in chalking out a fool proof method by which you can invest your current income safely so as to make it yield returns at a later stage. Employer sponsored retirement plans like pension funds are much preferred by many employees who think it would be sufficient to cover the expenses of their retired life. But this alone could be grossly inadequate what with the growing inflation rates, and may not be sufficient to fund active lifestyles. The same applies for pension that is obtained from private employers. People also invest in mutual funds and equity stocks also with a view to obtain high returns for their investment. This is definitely a smart move because in most cases, these are managed by professionals and hence armed either with adequate knowledge of the stock market ways or with the help of a competent financial advisor, you could make enough money post retirement too. Banks offer a wide range of savings deposit account as well as fixed deposit account which offer a comparatively lesser rate of interest. These are safer because the risk element is totally negated. But obviously, the interest rate is much lower and your money may not grow as much as you want it to. It pays a lot to find out about the various retirement programs provided by government as well as private organizations well ahead in life so that you can choose the best possible ones that offer more in terms of returns. Retirement planning is very important to assure a comfortable and secure old age that is filled with peace and happiness.